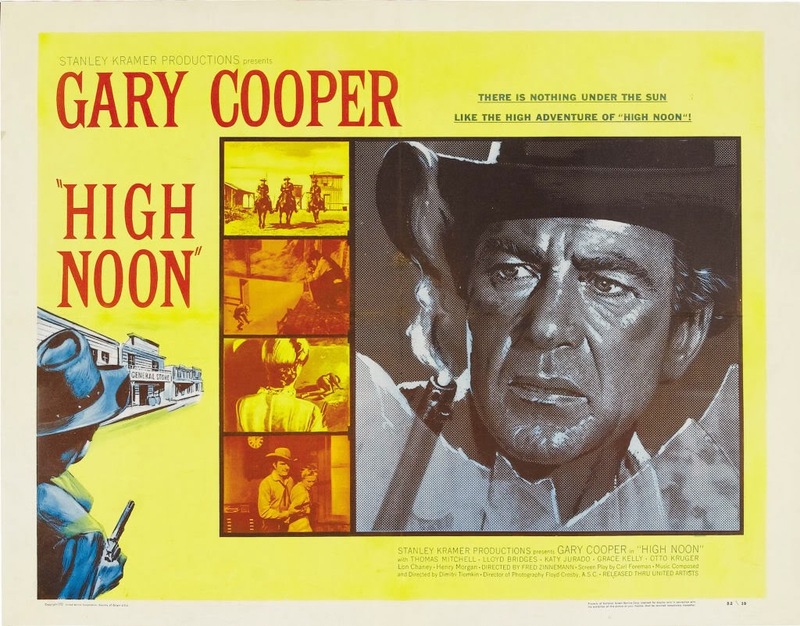 High Noon is a 1952 American Western film directed by Fred Zinnemann and starring Gary Cooper. In nearly real time, the film tells the story of a town marshal forced to face a gang of killers by himself. The screenplay was written by Carl Foreman. The film won four Academy Awards (Actor, Editing, Music-Score, Music-Song) and four Golden Globe Awards (Actor, Supporting Actress, Score, Cinematography-Black and White). The award-winning score was written by Russian-born composer Dimitri Tiomkin. In 1989, High Noon was selected for preservation in the United States National Film Registry by the Library of Congress as being "culturally, historically, or aesthetically significant", entering the registry during the NFR's first year of existence. In 1989, High Noon was selected for preservation in the United States National Film Registry by the Library of Congress as being "culturally, historically, or aesthetically significant", entering the registry during the NFR's first year of existence. The film is #27 on the American Film Institute's 2007 list of great films. Will Kane (Gary Cooper), the longtime marshal of Hadleyville, New Mexico Territory, has just married pacifist Quaker Amy Fowler (Grace Kelly) and turned in his badge. He intends to become a storekeeper elsewhere. Suddenly, the town learns that Frank Miller (Ian MacDonald), a criminal whom Kane brought to justice, is due to arrive on the noon train. Miller had been sentenced to hang, but was pardoned on an unspecified legal technicality. In court, he had vowed to get revenge on Will and anyone else who got in the way. The members of Miller's gang are his younger brother Ben (Sheb Wooley), Jack Colby (Lee Van Cleef), and Jim Pierce (Robert J. Wilke), and they wait for him at the station. Will and Amy leave town, but fearing that the gang will both hunt him down and also be a danger to the town and its people, Will turns back. His deputy, Harvey Pell (Lloyd Bridges), resigns because Will did not recommend him as the new marshal. Harvey agrees to stay if Will will support him, but Will refuses to buy his assistance. Will goes to warn Helen Ramírez (Katy Jurado), first Miller’s lover, then Will's, and now Harvey's. Helen is already aware of what Miller will do to her if he finds her and has sold her business. She prepares to leave town to avoid Miller but also to avoid seeing Kane killed. Amy gives Will an ultimatum: she is leaving on the noon train, with or without him. The judge who sentenced Miller is leaving and encourages Will to do the same. Will reclaims his badge and scours the town for help, with little success. The marshal who preceded Will supports him, but is too old to help and tells Will to get out of town. Will tries eliciting help from the locals at a bar and then tries the church. Nobody at either place responds, and few support him. Some even desire to see Kane's probable demise. Many of the townspeople encourage Will to leave, hoping that would defuse the situation. Even Will's good friends the Fullers are at odds about how to deal with the situation. Mildred Fuller (Eve McVeagh) wants her husband, Sam (Harry Morgan), to speak with Will when he comes to their home, but he makes her claim he is not home while he hides in another room. To make matters worse for Will, he goes down to the stables and considers leaving. Harvey turns up and encourages Will to go through with it, but Will refuses. Their argument turns into a full blown fist fight, ending with Will knocking out his former deputy and friend. In the end, Will faces Miller and his gang alone. Kane guns down Ben Miller and Colby, but is wounded in the process. Helen and Amy both board the train, but Amy gets off when she hears the sound of gunfire. Amy chooses her new husband's life over her religious beliefs, shooting Pierce from behind. Miller then takes her hostage to force Will into the open. However, Amy suddenly attacks Miller, giving Will a clear shot, and Will shoots Miller dead. As the townspeople emerge, Will stares at the crowd, contemptuously throws his marshal's star in the dirt, and leaves town with Amy. The plot's sequence of events occurs in approximate real time.